A CARLOW mathematics whiz has totted up an impressed €20,000 by winning a Naughton Foundation scholarship. 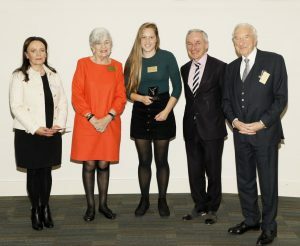 Clíodhna Ní Shé was awarded the coveted bursary at a ceremony in Trinity College Biomedical Science Institute in Dublin. The award, which includes a scholarship of €20,000, was presented by founding patrons of the Naughton Foundation, Dr Martin Naughton and his wife Carmel, who were joined by minister for education and skills Richard Bruton. A former student at Gaelcholáiste Cheatharlach, Clíodhna has accepted a place at Trinity College Dublin studying mathematics and joins 36 exceptional Irish students who were awarded third-level scholarships towards their studies in the areas of engineering, science and technology. Gaelcholáiste Cheatharlach was also presented with a prize of €1,000 on the day towards its science facilities. More than 160 schools have benefited from this prize to date, with some receiving it on more than one occasion. Since its establishment in 2008, scholarships worth over €4 million have been awarded to more than 200 students. The scheme started in three counties and has continued to expand, going nationwide in 2016.